As Caverswall Cricket Club approached it`s Centenary in 1989 Bill Evanson took on the task of producing a booklet ‘One Hundred – Not Out …’ that would tell the story of the Club during it`s first 100 years. Bill`s intention was to create a “potted history” within a few pages rather than a detailed account which would certainly require more than one volume. In 2011 Bill reproduced the booklet for the new generation of members who had never seen the original and took the opportunity to include some additional facts and details that had emerged since the original was written. I have taken some of the key points from Bill`s fascinating account to produce an even more potted version for this webpage. The origins of cricket are shrouded in the mists of time. The commonly accepted view is that an early version of the game was played in southern England during the 16th century. There is a written record of a court case from 1597 where one of the witnesses stated “hee and diverse of his fellows did runne and play at creckett and other plaies.” It seems likely that as the popularity of the game spread across the country the good folk of Caverswall would have formed a village team. 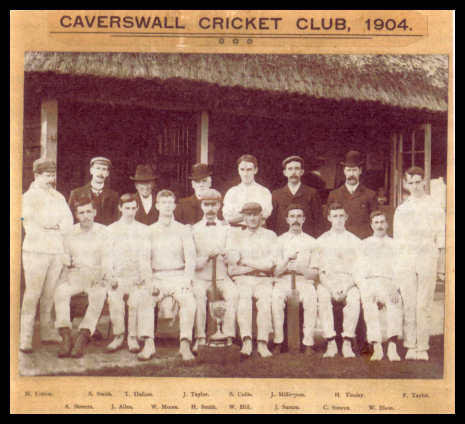 Caverswall Cricket Club was founded in 1889. The original patron of the club was William Eli Bowers, he was a wealthy businessman and colliery proprietor. William lived with his family at Caverswall Castle and he created a cricket pitch complete with a pavilion within the castle grounds. The edition of the Staffordshire Sentinel published on the 4th of May 1889 reports a forthcoming fixture between Caverswall and Cheadle on the 12th of June. A glimpse of an early Team Sheet is provided by a report in the Leek Post and Times on the 7th of June 1890. Caverswall were playing Oakamoor and the team were recorded as – Stuart, B Broadhurst, J Broadhurst, Best, A Tunicliffe, Taylor, Fisher, Hughes, Forrester, W Tunnicliffe and Allen. During the early 1900s Caverswall become members of the Churnet Valley Cricket League. There were a number of match reports published in both the Leek Post and Times and in the Cheadle Times. 1905 was a particularly notable year, the Club topping the League without losing a single match. Standing : M. Cotton, S. Smith, T. Hallam, S. Collis, J. Middleton, H. Tinsley, F. Taylor. Sitting : A. Bowers, J. Allen, W. Moore, H. Smith, W. Hill, J. Sutton, C. Simcox, W. Elson. In addition to his generous patronage William E. Bowers was also a keen player. His son William Aubrey Bowers shared his enthusiasm for the game and also became a player. William Eli Bowers died at Stone in July 1911 and in the years following his death it seems that the family continued to support the Club. The outbreak of the First World War slowed and later stopped the progress of the club. A report in the Cheadle Times dated the 18th of June 1915 records a meeting of the Churnet Valley League noting that Caverswall were no longer able to field a team due to commitments to the war effort. William Aubrey Bowers served as a 2nd Lieutenant in the 5th Battalion of the North Staffordshire Regiment. He sustained fatal wounds during the action at Gommecourt in France and died on the 2nd July 1916. Caverswall became members of the North Staffs and District League in the early 1920s. They won the championship of the B Section in 1923 and again in 1930. The Club was thriving and around 1930 an additional playing area was created near to The Red House pub in the village and a third team was entered into the Stone League. Back Row : Mo Cotton, T. Adderley, G. Freeman, G. Hurst, S. Farmer, J. Tabbernor, E. Rowley, Unknown. 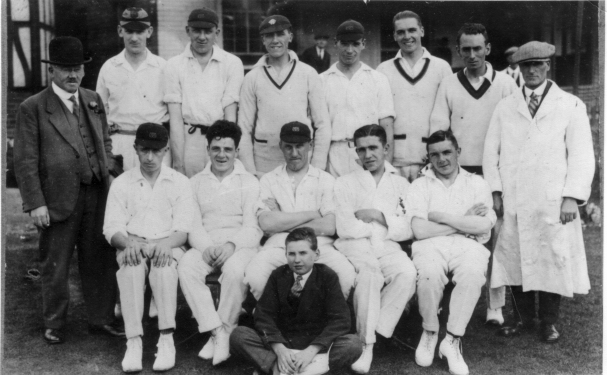 Front Row : C. Simcox, W. Collis, G. Sherwin, W. Stanley, W. Colclough. 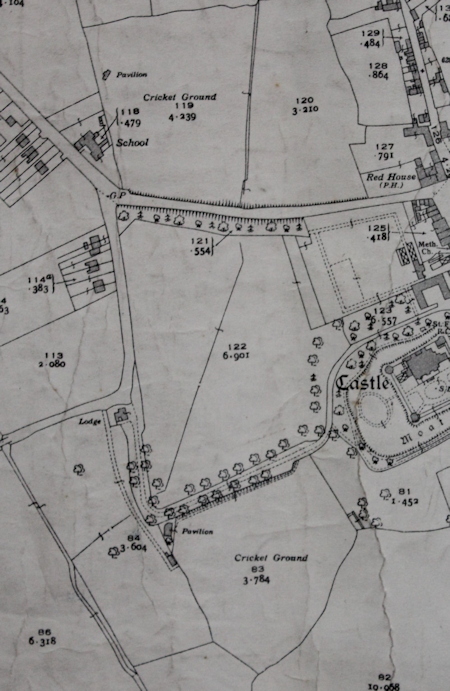 The map on the left is an extract from the 1937 Ordnance Survey map of Caverswall. It shows the location of two Cricket Grounds, the original site adjacent to the castle and the second ground located between the Red House pub and St Peter`s School. In 1933 the Bowers family sold Caverswall Castle and the estate including the much treasured cricket pitch and pavilion. It is easy to imagine how the tenants of the estate, the villagers and the members of the Cricket Club must have speculated about who the new owner might be. It turned out that for the second time in its history Caverswall Castle became the home of a religious community when in June 1933 The Mission Congregation Servants Of The Holy Spirit became the purchasers. 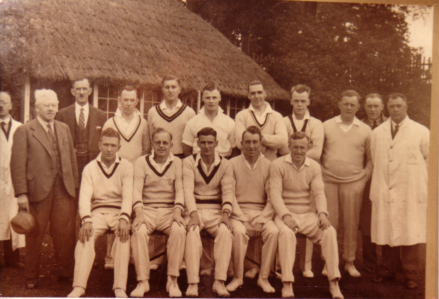 Another key event from the 1930s was the selection of the first Caverswall player to play for the Staffordshire County side. Ernest Wakelin was a fast bowler and his talents were quickly recognised by the County. He was a positive influence both on and off the field for Caverswall and the fortunes of the club were improved. The Club felt the benefit of a number of very good players at that time including Alf Pickard, D Harper, HS Roberts, Albert Foreman, Alf Massey, Allan Pate, Ernest Shenton, Ernest Plant, Norman Wardle, Ike Hadley and Jim Hughes. Back Row : Umpire Mo Cotton, A Pickard (Snr), Bill Collier, Alan Pote, Charlie Shenton, Joe Tabbenor, Ernie Plant, Frank Barber. Front Row : Unkown, Ernie Wakelin, Alf Pickard, Bert Roberts, Jim Hughes. In September 1941 the Chairman of the Club, in recognition of the increasing practical difficulties reluctantly proposed that “Club activities shall cease for the duration of the war.” The motion was carried and three members were appointed as Trustees with the responsibility of finding a solution to the ground problem and reviving the Club at the end of hostilities. Despite the best efforts of the Trustees and other members who were exempt from war service the Mother Superior could not be persuaded to change her mind. Although the Club now had a ground everyone recognised that the arrangement could only be temporary and that the playing area was not really good enough. Consequently the quest to find a suitable site continued. Finally in 1953 the Club successfully negotiated the purchase of the parcel of land at Caverswall Road Weston Coyney which was to become the new home of Caverswall Cricket Club. An additional piece of land where the present day car park is located was purchased at the end of 1956 for the princely sum of £0.10 per square yard. For many years the Annual Dinner Dance and presentation of awards was held in January at Weston Coyney Village Hall. The tradition began in 1958 just one year after work to build the Village Hall had been completed. Each year a group of volunteers would take out dozens of trestle tables from the store room at the Village Hall and arrange them in the required rows. The Bar was transferred from the club house for the evening which meant transporting kegs of beer with the pumps, bottled beers and a range of spirits and other drinks. Even the beer mats and ashtrays had to be taken to the hall for the evening. The Caterers would arrive in the afternoon to begin the preparations for serving around 150 members and guests. 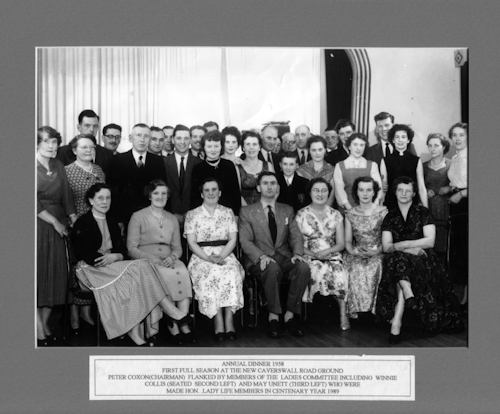 The photograph on the right was taken at the first Annual Dinner in 1958. The caption states : First Full Season at the Caverswall Road Ground. Peter Coxon (Chairman) flanked by Members of the Ladies Committee including Winnie Collis (seated second left) and Mat Unett who were made Hon. Lady Life Members in Centenary Year 1989. Gordon Ellis was one of the young men who came to watch people like Clive Collis play in the late 1950s. Gordon can recall the names of some of the people in the photograph. Standing, L to R. Gladys Harvey, Florrie Hulse, above her Harry Unett then Dennis Bates, Albert Foreman, Norman Dale, Cyril Hankey, Albert Broad, Reg Lamonby, Unknown , Unknown then Mrs Bailey, Ernest Rowley, Charlie Bailey, below him is a young Paul Collis, then Jim Horton, Unknown, Unknown, Unknown, Unknown, then Clive Bailey with his wife Doreen, Unknown and Unknown. Sitting : Unknown, Winnie Collis, May Unett, Peter Coxon, Dorothy Broad, Margaret Bates and Elsie Bailey. In 1959 work commenced on a new pavilion to replace the old wooden building which had been taken down at Bolton Gate and then rebuilt at Caverswall Road. The new pavilion was opened in the spring of 1961. In addition to the new pavilion a major change to the membership structure of the Club took place in 1961. The Management Committee had decided to apply for a Licence to run a bar and it was also recognised that additional funding for cricket activities could be obtained by extending the membership to include Social Members. The first Social Committee was formed in July 1962. The bar proved to be a success and the revenue obtained helped to counter-balance the rising costs of improving the ground and other facilities. To begin with the Bar was run by volunteers from the membership and it was not until July 1967 that paid staff were brought in at the weekends. 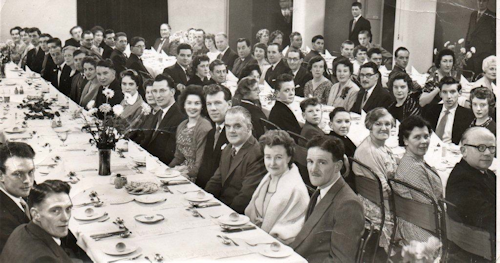 Gordon Ellis has provided this photograph of the members and guests at an Annual Dinner in the 1960s. Gordon recalls that the photographer also took another photograph from the opposite corner of the room. Does anyone have a copy of that photograph ? In 1969 Alan J Gott became the Chairman of the club, a role he would still be in when the club celebrated its Centenary Year in 1989. The early 1970s proved to be a turbulent period, in 1971 a proposal for a merger of grounds and facilities was received from the Old Longtonians Rugby Football Club. The idea seemed attractive to many of the members and officials of the club but there were many others who had doubts about the proposal and in particular about the long term implications. To resolve the situation the matter was put to the vote at a General meeting on the 19th of June 1973. Following a heated debate the motion for the merger was defeated. A series of building improvements was carried out in the 1970s including new brick-built dressing rooms, indoor toilet facilities, construction of a link between the changing rooms and the clubhouse and a single story extension to the pavilion which enlarged the bar area and created a new kitchen. The Club rules were amended in 1973 to permit the creation of Associate Memberships at a reduced subscription fee with the option to take up a Full Membership after a period of 2 years. In 1981 club members voted to leave the North Staffs and District League and join the North Staffs and South Cheshire League. The Club celebrated its Centenary Year in 1989. One hundred years of dedication and hard work had led to the position where the Club owned its own ground, there were no debts and there was a strong and flourishing membership. The Club was fielding 2 senior teams, an under 18s team in the Kidsgrove League and a junior team in the Blythe Valley League. Bill Evanson is a former Club Secretary and a resident of Caverswall.